The Kingdom of Swaziland offers everything to everyone, with some of the finest wildlife and cultural experiences in southern Africa. Explore SA took part in a trip organised by the Kingdom of Swaziland–we were wowed by the experience. We zip-lined through the mountains into the sunset on our first evening. Nothing compares to the variety of thrills coming from all sides as you rush through the air, harnessed to a cable, above a vertiginous drop. The trees and plants of the Sihlotswane gorge in all their beauty, the ancient stones, the river far below, and the russet clouds in the far distance, above the mountain tops impinge upon your senses like a kaleidoscope intensified by sheer adrenalin. What a welcome to the mountain kingdom of Swaziland, where thrills and adventure await around every corner. Situated in the Malolotja Nature Reserve, the Malotja Canopy Tour comprises 11 elevated forest platforms, 10 slides and a nerve-wracking shuffle across a 50-metre long suspension bridge high above the Majolomba River. 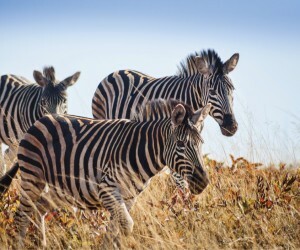 On your way to the start, from the vantage point of an open game-viewing vehicle, you can expect to see a wide variety of mammals and birdlife, from blesbuck, eland, impala and zebra to rare birds such as the Forest Canary and Ground Woodpecker. Then it’s a steep walk to the start, a brief introduction to the equipment, and you’re off! Perspectives shift from platform to platform—no moment is the same as the next. The guides are professional and competent, capable of reassuring the most nervous would-be zipliner that they are in safe hands. They are also extremely friendly, with a relaxed hospitality that seems a universal Swazi trait, and are glad to share their fascinating knowledge of the surrounding ecology. The tour usually takes three hours to complete. From Malolotja we were driven to Maguga Lodge, a comfortable old-school establishment perched on the edge of the moutains overlooking the mighty Maguga Dam. Close to the Ngwenya Border Post, Maguga Lodge is one of those places where hurry is unheard of, which is a good thing, because you really need the time to let it all sink in. Merely sitting at a table on the veranda and taking in the view justifies a few hours of your time. The gaze roams across the dam, the plains, and further mountains … The landscape is dotted with Swazi homesteads, spread out in a way that seems to follow a natural balance, rather than imposing themselves on the land. Our schedule didn’t permit us to try out any of the activities for which Maguga Lodge is famous –boat cruises along the dam, freshwater fishing, bird watching, hiking, craft tours – but we were lucky enough to enjoy a cultural experience that was as memorable as it was unpretentious. Not far from the lodge lies the homestead of the Mnisi family. Here, Sipho Mnisi showed us how the Swazi people have managed to adapt their traditional way of life to the demands of modern times without compromising on their cultural authenticity. There is a pattern woven into the way the homestead is laid out, with its separate entrances and meeting places for men and women, sturdy clay huts for boys, girls and married folk screened by traditional reed wind-breaks, and the parliament house where everybody gets together at the end of the day. The children are kept busy with tasks that prepare them for the future, while the fields yield crops that provide food security for the extended family. Above all, there is a sense that the homestead is not separate from the landscape that lies beyond its palisade – they form part of the continuum that underpins the cultural life of Swaziland. Leaving the homestead, I had the sense of having come into contact with a self-sustaining cultural force as ancient and simple as the mountain stones. The greatest complexity arises from simplicity. Bidding the Mnisis farewell, we drove at a leisurely pace along one of Swaziland’s narrow but well maintained roads along the Jubukweni route towards Mbabane, stopping along the way to appreciate the grandeur of Sibebe Rock, the largest freestanding rock in Africa and, after Ayers Rock, the second largest in the world. However, at three billion years, Sibebe is much older. This massive chunk of granite mesmerises the feet, which chafe to climb the steep ascent as soon as you reach the base. Sibebe is 800m high, so walking to the top and back can easily take four hours. The effort is rewarded by spectacular views and the opportunity to explore caves, swimming holes and waterfalls. Bird watchers especially are in their element, as Sibebe abounds with avian inhabitants, including the globally threatened Blue Swallow, observed to breed in these parts. Sibebe Rock trails is a community tourism initiative and forms part of Swaziland’s Community Tourism Programme. For a capital city, Mbabane has to be one of the most laid-back in the world. Driving into town through the granite outcrops on the outskirts, it’s striking how spread out it is, bathed in sunshine and tranquility. Lunch at Ramblas Restaurant afforded a brief glimpse into the lifestyle enjoyed by the city’s fortunate citizens. With the wind stirring the stupendous tall trees, we had a chance to catch our breath and discuss our experiences. As we enjoyed creative freshly squeezed juice cocktails and mouthwatering plates of traditional Swazi meat stew, everybody agreed that a considerable portion of Swaziland’s charm lies in its people. Perhaps it’s the quiet self-assurance, perhaps it’s the evident pride in their culture – Swazis own their world, and it shows. This impression was reinforced by a cultural encounter at Mantenga Cultural Village, in the Mantenga Reserve, a protected area of 725 hectares in the Ezulwini Valley, or “Valley of Heaven”, not far from Mbabane. The village can be described as a living museum that portrays the Swazi traditions and lifestyle of the 1850s. There are 16 huts, kraals and byres for cattle and goats, reed fences and other structures. The experience includes numerous occasions to interact with the people in the village by grinding maize, plaiting reeds or joining in the colourful and exhilarating song and dance display that concludes the visit. This last comes courtesy of the Mantenga Cultural Group, a permanent troupe of singers and dancers who have been taking Swazi culture to the world since 2004. I was grateful to have visited the Mnisi homestead earlier, because otherwise I might have assumed that the Mantenga Cultural Village was merely a picturesque museum piece. Instead, it revealed itself as a cultural blueprint for the homesteads spread out across Swaziland as a whole, as well as a functioning cultural centre in its own right. Another destination in Ezulwini that combines an incredible tourist experience with an invaluable conservation function is the beautiful, secluded Mlilwane Wildlife Sanctuary, between Mbabane and Manzini. Covering 4 560 hectares, the Sanctuary is divided into southern grasslands extending as far as Nyonyane Mountain with its famous “Execution Rock”, from which condemned criminals were once forced to walk, and the northern mountains beyond. There is a wide range of accommodation to suit all pockets, from camping to a fully catered lodge, and the sanctuary can be explored on foot, horseback, by mountain bike or game drive. My personal favourite would be to ride one of the Sanctuary’s beautiful horses through the grasslands. The horse allows you to approach the wildlife up close, whereas a motor vehicle might spook them or make them aggressive. For a few precious hours, on the back of a hardy Swazi horse, you become part of the landscape itself. Mlilwane is an especially good choice for people who don’t have time to explore beyond Manzini, as it is close to a number of must-visit tourist attractions. The stalls of the Ezulwini Arts and Crafts Market hold a plethora of African curios for the visitor to take home. Although much of the merchandise is similar to what may be found in similar markets from Cape Town to Lusaka, the stall holders are in a class of their own. The most experienced haggler would be hard put to fend off their practised charm. Also close at hand are the Swazi National Museum and the King Sobhuza II Memorial Centre, with its Eternal Flame dedicated to the memory of the king who did so much to preserve Swaziland’s independence and integrity. Both are well worth a visit for anyone who wishes to deepen their understanding of Swazi culture. In nearby Malkerns Valley is one of the most popular tourist stops in all Swaziland – the Swazi Candles Centre. Shaded by a canopy of tall indigenous trees, this shopping mecca combines the famous Swazi Candles factory shop, with its array of unique hand-crafted candles in a staggering variety of shapes and colours, as well as nine other arts and crafts shops, the Sambane Cafe and a handicraft market. You can easily spend hours here, watching the artisans at work, browsing for gifts you won’t find anywhere else, or sampling delicious food and drink. Apart from the candle factory, highlights include the stunning designs of Baobab Batik, beautiful bags by Amarasti, and fashion and home décor accessories in glorious traditional African colours and designs by Rosecraft Weaving. Another option in the area is Summerfield Luxury Resort and Botanical Garden, an “Integrated Botanical Conservancy and Leisure Resort” committed to nature conservation. This national conservancy combines Swaziland’s largest collection of exotic and tropical palms and plants with a treasure trove of indigenous trees, pre-historic cycads and rare indigenous plant species. A leisurely meander around the gardens followed by a meal at the opulent restaurant, which combines classical African motifs with baroque and avant-garde design concepts, makes for an exceptionally profitable morning or afternoon. After sampling these varied delights, travellers with time and money to spare would be well advised to consolidate it with a stay in one of Swaziland’s bigger game parks. We had the good fortune to experience two. Mkhaya Game Reserve lies in the southeastern lowveld. 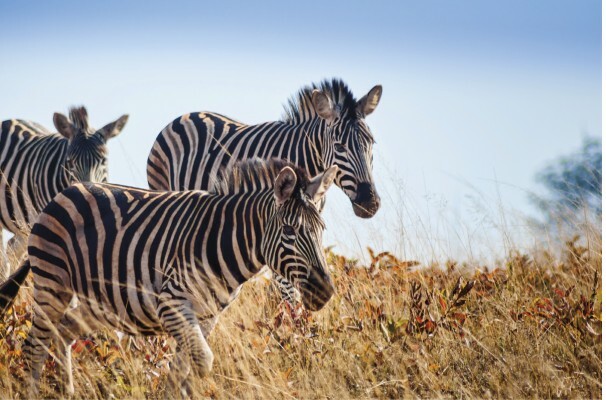 Home to four of the Big Five, as well the pure-bred Nguni cattle, tsessebe, white rhino, elephant, giraffe, buffalo, hippo, crocodiles and exquisite birdlife, its accolades include the AA’s “Travellers Value Award for Top-End Leisure Travellers”. Close-up game encounters are virtually guaranteed. Even with the present drought, we saw rhino, hippo and lion up close, thanks to the expert tracking techniques of our guides, for whom a patch of crushed grass or a bent twig is as good as a detailed map. The accommodation is one-of-a-kind, namely half-walled sleeping quarters open to the night sky. With a metal gate to keep out hyenas and impenetrable mosquito nets, guests can allow themselves to be lulled to sleep by the sounds of the bush under African stars. The staff at Mkhaya are fantastic – the wardens are passionate and have an encyclopedic knowledge of the bush, while the house staff are attentive and dish up the most delicious meals, including bush meat. Every evening, they don traditional apparel and lead the assembled guests in a song and dance around the fire. It’s one of those places you wish you didn’t have to leave. I certainly could have done with a few more days. Then there is the flagship of the Kingdom of Swaziland’s many game reserves – Hlane Royal National Park: 22 000 hectares of of north-eastern Swazi bushveld providing sanctuary to the Kingdom’s largest game herds, including lion, elephant, rhino and leopard, as well as hippo, giraffe, crocodile and many more. Then there is the incredible bird life, including Africa’s densest concentration of nesting White-Backed Vultures as well as the southernmost nesting colony of Marabou Storks. Activities include self-drive roads, open Land Rover game drives, lion or rhino tours, guided mountain bike trails, birding walks and a cultural tour of the Umphakatsi Village. On the way back to the border, we visited Swaziland’s hottest tourist attraction, the glass-blowing works at Ngwenya Glass. This proved to be an experience unlike any other. From the safety of an elevated gallery, you can watch the glassblowers in their red suits heating glass in a furnace and then blowing them into fantastic, extravagant shapes. It’s a fascinating spectacle. The products of their creativity are all on display in the shop, and the beauty and variety of these creations are so magnificent that it’s no wonder that Ngwenya Glass is one of Swaziland’s most popular tourist attractions. Run by Chas and Cathy Prettejohn since 1987, Ngwenya Glass is also an inspiration to the environmentally friendly minded. Only re-cycled glass is used. Bottles are collected from all over Swaziland and the collectors are paid per kilogram of clean glass. A portion of glassware sales go to the Ngwenya Glass Rhino and Elephant Fund, which works with great success to preserve these magnificent animals, which have twice almost been driven to extinction in Swaziland in recent times.